I recently received a package of cigar from Miami Cigar. Inside were 6 different varieties of a Mid-Atlantic regional exclusive release for a new vitola in the La Aurora Preferidos lineup. 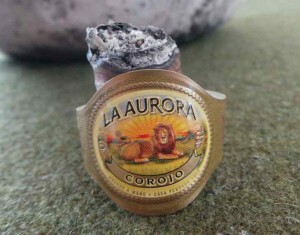 The offering will include the original Preferidos blend, draped in each of the six wrappers (Brazilian sungrown (Ruby), Cameroon (Platinum), Connecticut (Sapphire), Connecticut broadleaf (Diamond) Corojo (Gold) and Ecuadorian Sumatra (Emerald)) – but in a 5.5” x 42 Corona Especiales. They will be sold exclusively in the Mid-Atlantic region, and retail for about $7.20 per stick. The line will also be available in a 150-count crate containing 25 each of the wrapper varieties. 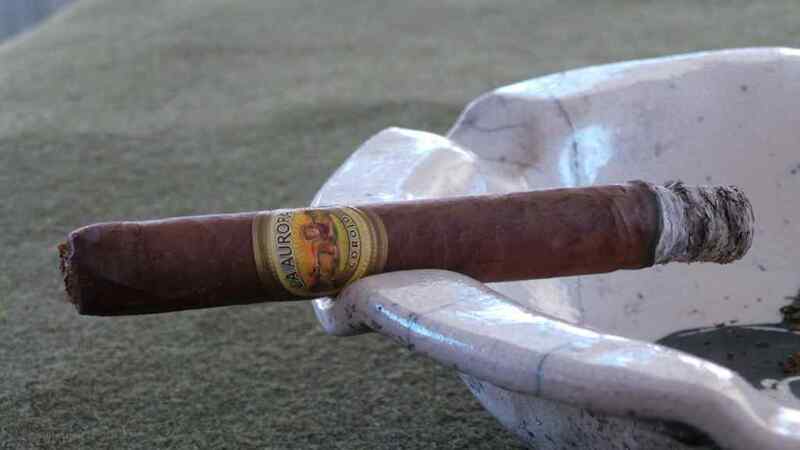 Today’s review is for the Gold (Corojo) rendition. It features a Dominican Corojo wrapper over Dominican binder and a filler mix of Dominican, Brazilian and Cameroon tobaccos. The sample I received displays a medium brown color with some moderate mottling. The wrapper leaf feels oily and very smooth, but little sheen is visible. Veins are sparse but pronounced. The foot feels a bit less dense than the rest of the stick, but overall the pack was sound throughout. Prelight, the draw is of deliberate but open resistance, and provides little in the way of flavor. Maybe some slightly earthy notes but not a great deal more. The aroma is mild and straightforward tobacco in character. Initial puffs present solid spice, and some pleasant – and crisp – charred oaken flavor that, if slightly sweeter, might have led me to call it leathery….or even buttery. I get a lot of (black) pepper from it, which probably pushed me more toward considering it of a more woodsy nature. The burn immediately resolves, and will continue to remain very sharp throughout the duration of the cigar. By the middle of the cigar, the spice has subdued but never wanes entirely. It takes on a more “tropical spice” tenor, reminiscent of bright baking spice rather than the early pepper. This transition is fairly abrupt, occurring more rapidly than one might normally expect. There was very little transitory time, and no muddling of flavors at all. These more mellow characteristics continue throughout the midsection of the smoke. Somewhere around the end of the third inch I noticed another, less sudden progression back into a bit more pepper. This time, however, the pepper is felt more on the soft palate and is more akin to red than black pepper. It should be noted that although I’ve spent a good bit of time writing about this spice, it is NOT of the variety you might find in the Preferidos’ Nicaraguan cousins. There is also a core cedar component, which tempers the spice as well. It remains approachable and palate-friendly to most any smoker. It’s during the final portion of the cigar that I believe it really shines. The strength picks up a notch, but never becomes overtly potent. I would place it solidly in the medium range in this regard. The flavors do intensify as I near the end, with the cedar and pepper playing the dominant roles. It smokes down to a 1″ nub, the evidence of 80 minutes well spent. When supported well by complementary components, a Corojo wrapper can be a beautiful thing; when mishandled or mismatched, a disaster. The Preferidos Gold Corona Especiales delivers the former. I thoroughly enjoyed the early spice over its woodsy core, the development into a calmer midsection, and surprising peppery denouement. If you live in the Mid-Atlantic region, I’d definitely recommend investigating these while you still can. It is possibly my favorite of the six variations. With apologies to the big ring fans, I love the size as well. As a final parting shot – give these a try with a solid cup of coffee. I don’t have easy access to more, but my hunch is the pairing would get along swimmingly.